The weather is truly awful, it’s raining and has been for about 3 days straight. So what do you do when you can’t leave the house? Bake. It’s a sure-fire way to occupy an incredible amount of time and test your patience (therapeutic baking has eluded me thus far). It annoys the hell out of me when I hear the likes of Paul Hollywood talk about how he gets his kids to help out in the kitchen and they’re great a knocking out a “simple” Neapolitan pizza dough. Being bested by a 7-year-old is a certainty to knock your confidence especially when you’re trying so damn hard, as I do when I attempt to bake. Rather than take it easy on myself and tackle something simple like a vanilla cupcake I decided I’d bake a cheesecake ripple chocolate cake (adapted from a recipe in Baked Elements) as it sounded rather impressive and tasty, that’s the most important thing after all. Success would pave the way for sourdough breads, rich southern layer cakes, buttery French pastries and gooey chocolate fondants. But I didn’t quite succeed. My bake wasn’t of the rich indulgent variety that has anyone going back for seconds. It was OK, in the same way that a store-bought cake can be okay but it didn’t cost €12 and 3 hours of your time. So you ask, why should you make this cake? If you do it right it will undoubtedly turn out great. 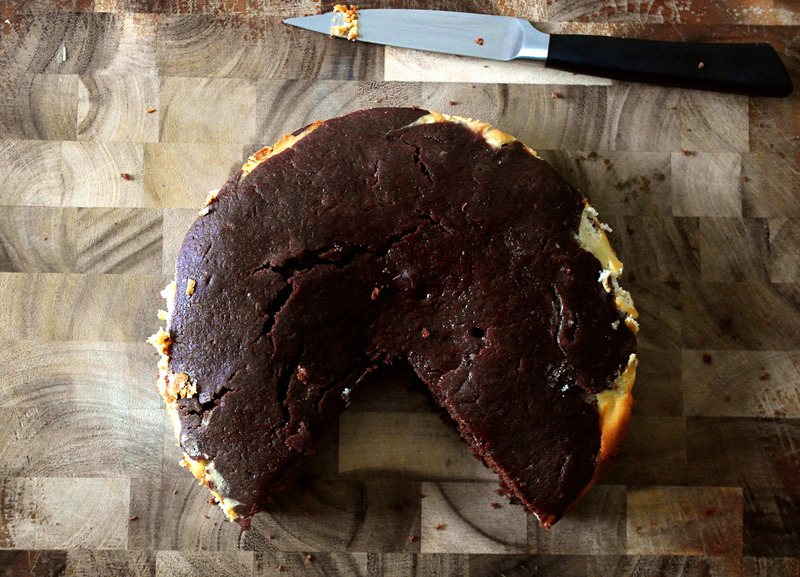 Who wouldn’t like rich chocolate cake marbled with white chocolate cheesecake? Most importantly I can help you by telling you where I went wrong. Sure, a list of instructions is great but if you’re “baking challenged” like me, a list of what not to do will serve you just as well. As I said, my cake was acceptable, if not great, however, there were hints of fudgey chocolatiness where it hadn’t over-baked and the scant remains of the cheesecake layer suggested the potential for something truly brilliant. Well that’s if you think Milkybar is brilliant, and who doesn’t? Beat the cream cheese in a stand mixer until smooth. Add the sugar and beat until it is incorporated and the mixture is lump free. Add the egg, vanilla, and salt, beating until incorporated. Heat the oven to 170 Celsius or 350 Farenheit. Butter a 10 inch springform tin (my tin was too small and end up not having enough room for all the mixture which meant no defined layers and definitely not enough cheesecake mixture) and line the bottom with baking paper. Whisk together the flour, sugars, baking powder, espresso powder and salt in a large bowl. In a second bowl, place the cocoa powder, 2 ounces chocolate, and the butter. Pour in the coffee and hot water and whisk until smooth. Add the oil, vinegar, and eggs and whisk again until the batter is completely smooth. Make a well in the dry ingredients and pour in the wet ingredients. Fold in the dry ingredients until just mixed. Fold in the remaining chocolate chunks. Pour half the chocolate batter into the prepared tin and smooth with a spatula. Pour all the cream cheese mixture (seems like a lot but it does disappear a little during the bake) over the chocolate layer and top with the remaining chocolate batter. Tap the bottom of the tin to remove the air bubbles. Place in the centre of the oven for about 25 – 32 minutes. Check it after 25 and a skewer inserted should come out with a little chocolate. If it’s completely clean it’s over done. I cooked mine for 30 minutes and its nice in the centre but the edges are dry and crumbly which kills the chocolate flavour. 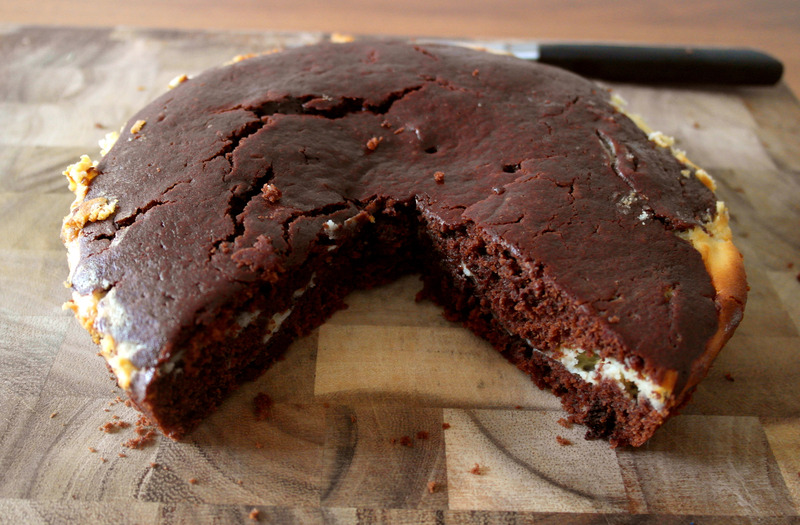 The cake can be stored in the fridge in an airtight container for 5 days. Oh my that looks delicious and so moist!